Benld Township High School "Indians"
Benld (population 1,541) is located in southwestern Illinois about 20 miles northeast of Alton. It is situated in the southeastern corner of Macoupin County. Illinois Route 138 intersects with Illinois Route 4 on the west side of the town. A branch of the Cahokia Creek flows through the center of town. The Chicago & Northwestern Railroad lays tracks through town as well. ....In 1904 Benld became a village and has grown to be a city; Benld will celebrate its centennial from September 04 to September 06, 2004;" . The history of its former high school is in need of research. We do know that Benld had a high school for their children which was probably established in the late 1800s to early 1900s. According a web page on the Gillespie High School website (http://www.gillespie.macoupin.k12.il.us/) the towns of Gillespie (located 1 mile north of Benld) and Benld agreed to merge their districts "in the early 1960s". Benld High School was closed and the children of Benld began attending Gillespie High School for their secondary school education. The above pictured building served as the junior high and 9th grade attendance center from the merger until 1993. From 1993 until 2002 it was used as a part of the Benld Elementary School. 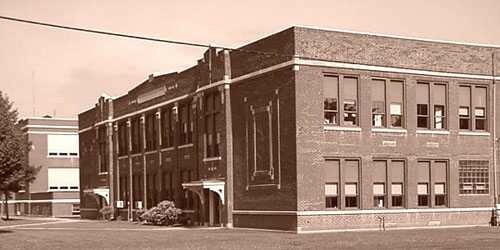 The building was demolished in 2002 to make way for the new Benld Elementary School building. Benld Township HS team nickname: the "Indians"
School Fight Song: "We're Loyal to You Benld High"
Victory from you Benld High! The boys sports of baseball, basketball, and track all earned a measure of success in IHSA competition (www.ihsa.org). Football was also offered at Benld High. School team records, and coach's names are all items we are searching for. Benld was a member of the South Central Conference from 1935-1960. The Benld High School diamond men earned a total of three District titles. All three titles came in back to back to back seasons in the mid 1940s. Unfortunately this is currently the only information on Benld High School baseball success that we have available. 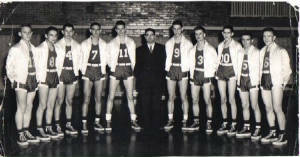 Basketball was the main sport at Benld High School in the 1940s and 1950s. A total of four Regional titles and six District titles were cause for many an exciting winter night in Benld. Again, unfortunately, team records and coach's names of these and other great Benld High basketball teams are not currently available. Several scores involving Benld High School participating in the IHSA State Tournament can be viewed on a web site titled "Illinois Postseason Basketball Scores." The link to this web site is https://sites.google.com/site/xtmi2000/ . Scores found that are from championship seasons involving Benld High School are reprinted below. BENLD (44): Tartar 11, Anderson 9, Audi 8, Tillas 6, Contralto 5, Derna 5. The Benld thinclads also got into the IHSA competition winning business with three District titles of its own! All three titles came in back to back to back seasons in the early 1940s! In addition FIVE individuals and one relay team won medals at the IHSA State Meet. 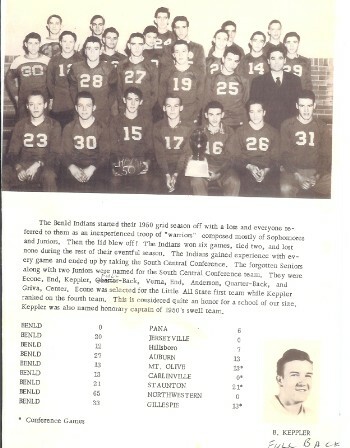 Benld Township High School's Indians competed in football as well. We don't have all of the season records, but the photo to the right was sent to us by Darwin Griva. It is a photo of the South Central Conference Champions of 1950-51. The team was coached by future Illinois Hall of Famer Adolph "Chief" Tenikat. Coach went on to coach at Gillespie High School. This team finished the season at 6 - 1 - 2 with the loss coming in the first game of the season. All-Conference members from this team included Econe, Keppler, Verna, Anderson, and Griva. Econe was also named to the First Team Little All-State Team and Keppler earned Fourth Team Little All-State Honors! Last game was a 21-0 win over Gillespie, the school they would consolidate with the next year. "1. As told to me by me dad who was a sub: My dad graduated in 1925. That year the senior class had extra money in its Treasury. They sponsored the football team to go to Chicago and play the Chicago city champions. Everyone thought for sure that we were going to win. The coach took them out to see Rudolph Valentino. They stayed at the Drake Hotel and changed clothes in a city park where the game was played. They got one player to come back to school and join the team because he was still eligible even though he was now 20 years old. The girls tutored him. He kicked a field goal on the kick off and that was the only points we made. I was told the coach had everyone tape their fists. They threw rocks at the ref. They were so mad that they lost by only a few points that they stole some of the other guy's clothes from the Park dressing room. Joe Saracco, who later became Superintendent of the grade school, was the quarter back and had been knocked unconscious. They carried him through the lobby of the Drake Hotel, all still in uniform. My dad said they put lineament all over his body and must have ruined the mattress. When I was a freshman in 1952 I remember reading a blurb in the St. Louis Post Dispatch that said, "everyone remembers when Benld had its gridiron." Joe Saracco was my basketball coach in grade school. I set an unofficial record that year. I fouled out in the first 5 minutes. Don't know why he left me in. 2. There used to be huge pictures of each class in the second floor hallway attesting to the excellence in typing and shorthand in the 1940s. What ever happened to all those pictures? 3. During the 1952-1953 basketball season I remember seeing Sam Anderson sink a two handed set shot from the center court line right when the buzzer was sounding the end of the fist half and again at the end of the game. 4. Don't remember which years but the Benld High School band won the Governor's trophy 3 years in a row at the State Fair. The high school band included many grade school players and many in my class joined the high school band for the first time when we were in fourth grade. The high school only had 104 students but with grade school students playing in the high school band it was a 70 piece marching band. 5. You can visit the Dorsey family cemetery plot fenced in at the cul-de-sac in the Benld Cemetery. 6. Superior Coal Company had four mines in the area numbered 1 through 4. However, "Mine No. 5" was the still in the woods behind the cemetery during prohibition. 7. Freshman initiation had a long tradition. It started with football practice before the school year began and lasted all year for the boys. All freshmen were expected to go out for football. The practice finally ended around 1953 after things had gotten a little out of hand. 8. Benld had a very good educational system and about half the class went on to college with many distinguishing themselves. Because the mines were shutting down and they went to division of work, my family moved to St. Louis where I finished my last two years of high school."